The Workbench does a good job of allowing you to monitor and make changes to your accounts, usually more quickly than AdWords. The Performance tab of BBM allows you to quickly monitor the budget pacing for all your accounts. Adobe Advertising Cloud is pretty expensive. It takes a very long time for a new user to get comfortable using Adobe Advertising Cloud. Great customer service and a terrific product. Their ability to manage social user interfaces directly isn't very strong. Within the interface there is an instant chat support feature that you can use to get help right away without having to pick up the phone or look for an email address. We have have an account manager who responds to emails quickly and is always helpful. Anytime issues require further tech support we are kept up to date on the progress of the issue and they are usually resolved the same day. We have started using Domo since we began using Acquisio and are extremely happy with Domo. 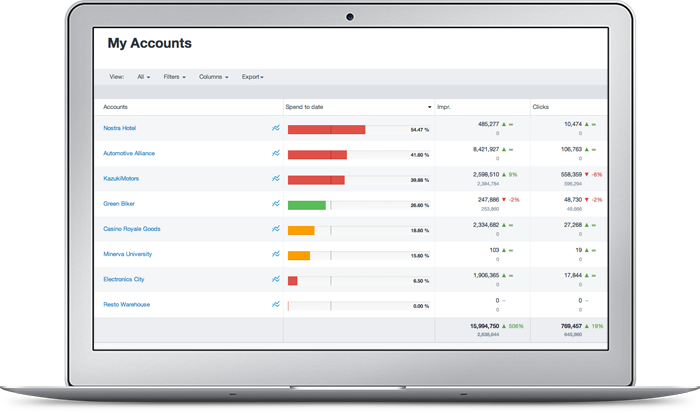 We will continue to use Acquisio though because of the ability to directly manage paid search ads and the ability to create simple reports quickly. Also considering the cost of Domo, unless you specifically need reports with more sources of data, Acquisio is all you really need. It's a fully managed service that makes it ideal for marketing individuals to have a one-stop location for viewing all their dashboards and track the performance of their ad campaigns.